Implementing New Mover Marketing campaigns can give entertainment centers (i.e. 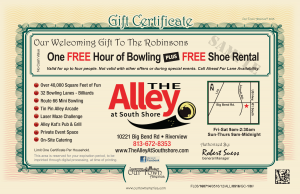 bowling center, movie theaters, go-kart places, etc.) a tremendous competitive edge. In today’s world, most people who move to a new house either have children or are young married couples who are likely to have kids in the coming years. Thus, new movers are prime potential customers for entertainment centers across America! Our Town America, the nation’s first and fastest-growing New Mover Marketing franchise, specializes in helping local businesses capitalize on the goldmine that is new residents. By delivering gift certificates with personalized offers right to a new resident’s mailbox, Our Town America helps local businesses get noticed. The moving industry is growing, so appealing to new movers continually draws in customers. Businesses just need a way to get their foot in the door; fortunately, Our Town America has the keys. A growing economy correlates to an increasing number of movers in the U.S. As companies begin to hire more and more employees, families are uprooting and moving to new areas to take advantage of those job opportunities. New, higher-paying jobs mean that families will likely have more expendable income. Local entertainment centers are a prime opportunity to get out of the house and do something fun as a family, so it’s no surprise that entertainment centers are keen to draw in those new residents. In addition, boomerang buyers are coming out in force. These buyers are the portion of the population who foreclosed on their homes during the recession and have been working to build their credit back up ever since. We’ve just about hit that point where those buyers are now able to jump back into the world of home ownership, and that often means a move to a new community. Regardless of why a family has moved, they are inevitably on the hunt for things to do in their new neighborhood. New movers mean new opportunities to draw customers in to your establishment. As families move into new neighborhoods, they are naturally looking for the nearby necessities such as grocery stores, hair salons, auto mechanics and more. Finding safe, family-friendly activities is sure to be high on the list of priorities as the family settles in. The key is to draw those new residents into your establishment before they come across your competition. Grabbing new mover attention early will help you build brand awareness and loyalty. It’s much easier to get customers in the door if you aren’t trying to lure them away from competitors. According to the Harvard Business Review, acquiring a new customer can cost five to 25 times more than retaining a current customer, depending on the industry and market. This is because you are not expending as much time and resources to target new clients. Instead, you focus on building out the quality of your establishment and work on keeping your current customers happy. In fact, according to research done by the Frederick Reicheld of Bain and Company, if you increase customer retention by just five percent, your profits may increase between 25 and 95 percent! Through Our Town America’s New Mover Marketing programs, you are ensuring your company is seen immediately upon a family’s arrival to the neighborhood. That initial awareness shows your company is active in the community and will help establish your credibility. The next step is to provide the customer with the incentive to come visit. Our Town America’s personalized gift certificates do just that. Our Town America’s success lies with the expertise of our corporate staff and franchisees. Our Town America will work with your entertainment center one-on-one to devise the perfect marketing campaign for you and your market. Our Town America gift packages deliver personalized and valuable offers that are geared specifically toward your target demographic. That customization, attention to detail and years of experience will make all the difference in your bottom line. 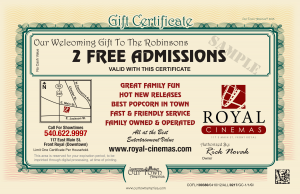 The innovative New Mover Marketing campaign has had a profound impact on businesses such as Royal Cinemas in Royal, VA. Rick Novak, the cinema complex owner, has used Our Town America’s services for more than seven years, calling it “the best Return on Investment for a business.” Unlike ordinary coupons, Our Town America evaluates each market and comes up with a custom strategy based on valuable offers built for that region. For Royal Cinemas, Our Town America capitalized on the trend of people migrating west of Washington, D.C. As a result, Royal Cinemas has seen an average monthly response rate of 11 percent, with some months exceeding 17 percent. Those numbers speak for themselves! New Mover Marketing campaigns work. 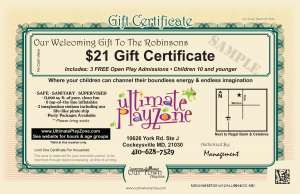 The same is true for Robb Tacelosky, owner of Ultimate Play Zone in Cockeysville, MD Tacelosky has worked with Our Town America for years and could not be more pleased with the results. Since 2014, he has been offering new movers a three-for-one admission rate to his entertainment center. He has seen “an exponential amount of new movers who redeem the gift certificate to become repeat, long-term customers.” Tacelosky believes that Our Town America has been invaluable to his long-term success. If you’d like to take your business to the next level, visit OurTownAmerica.com to learn more about Our Town America’s New Mover Marketing Programs. You can complete a contact form or give us a call at 800-497-8360. Be sure to mention this article!